Maximize the power of your Acura RSX, enhance its looks and let it sound like it never did before with one of the Skunk2 Performance Exhaust Systems. Designed to make your ride faster and more powerful, each Skunk exhaust system is made using premium quality T-304 stainless steel, robotically TIG welded, and features CNC mandrel bends to ensure a precision fit. You're sure to get true dyno-proven horsepower and torque gains with any of their exhaust systems on. Today you have a great chance to save on this upgrade. 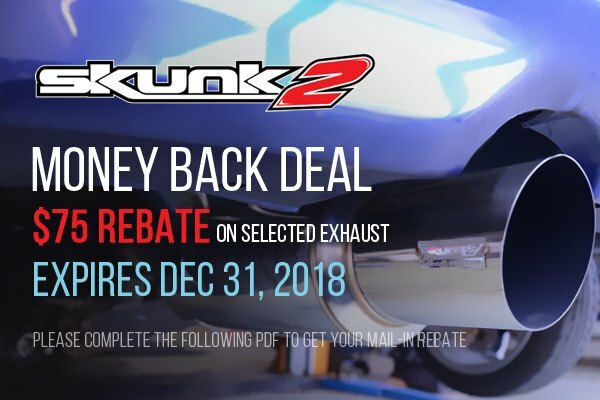 Purchase selected Skunk2 Exhaust and get $75 rebate. This deal runs until December 31, 2018. Please complete the following PDF to get your rebate. Take the power of your Acura RSX to the new level with Skunk2 Exhaust System on!